The presentation ceremony of five short films about rural women, organized by the Partnership for Human Development program (PHD), took place on October 23rd at the cinema Platinum Cineplex in Dili. The event was part of the celebrations of the International Rural Women’s Day, marked on the 15th of October, with the participation and support of several personalities and organizations. 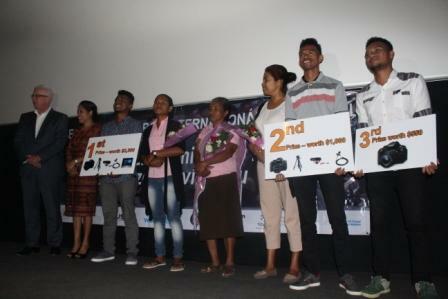 The highlight of the event was the award ceremony for the winners of the national contest for short films inspired on real life stories, launched by PHD last March. Ludovino Santos, a student of Timor Lorosa’e National University (UNTL) and the winner of the contest, presented a film that tells the story of a rural woman (Zélia dos Santos) who opened a mechanical workshop in Balibo, Bobonaro, with her own money. The second prize was awarded to Hermenegildo Maia, also a UNTL student. His film tells the story of Madalena Bidau Soares “Kasian”, a veteran who have built five schools for children in Liquiçá Municipality, with the money she receives from her veteran pension. Bernardo Sarmento, a UNTL student finalist, was awarded the third prize for his film about Nélia Boavida, who dedicates her life to supporting people with disabilities in a rural area. 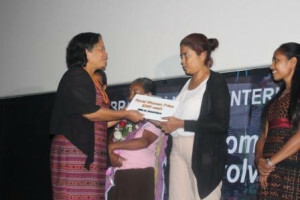 The prizes were awarded by the Spouse of the President of the Republic, Cidália Nobre Guterres, the Secretary of State for Gender Equality and Social Inclusion, Laura Pina Menezes Lopes, the Secretary of State for Youth and Labour, Nivio Leite Magalhães, the Vice-President of Timor-Leste Parliamentarian Women’s Group, Nurima Ribeiro Alkatiri, and the Ambassador of Australia in Dili, Peter Doyle. 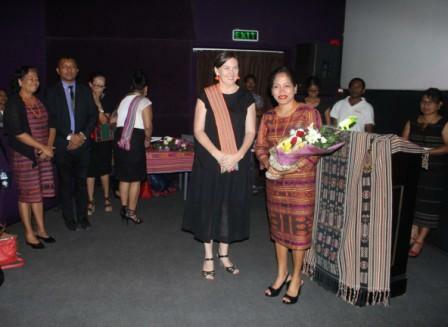 Around 150 people attended this event, including women’s representatives from several communities, Social Communication Degree students from UNTL and UNITAL, the diplomatic corps and development partners, civil society and the media. Two other short films were shown, one by Estêvao Tilman, UNTL student, which tells the story of a volunteer teacher (Hermínia Almeida) in a children’s school in Venilale, who participated in community leadership initiatives developed by the school and by the community, and the other by Egídio Nono, a student from Oriental University (UNITAL) which tells the story of a young woman (Eufrásia do Rego) who leads and carries out cultural and sports activities to promote peace in her community. This short film exhibition was part of a series of events organized by the Steering Committee for the Celebration of the International Rural Women’s Day, which includes members from the Secretariat of State for Gender Equality and Social Inclusion, Rede Feto, PHD, Tomak, USAID Avansa Agrikultura, UN Women and the World Food Program.